Laura Kipnis, a professor in the School of Communication at Northwestern University, and Harper Collins, the publisher of her recent book, Unwanted Advances: Sexual Paranoia Comes To Campus, are being sued by a Northwestern philosophy graduate student, “Jane Doe,” for public disclosure of private facts, false light invasion of privacy, defamation, and intentional infliction of emotional distress. The issues at hand originally stem from Title IX complaints against former Northwestern University professor of philosophy Peter Ludlow. 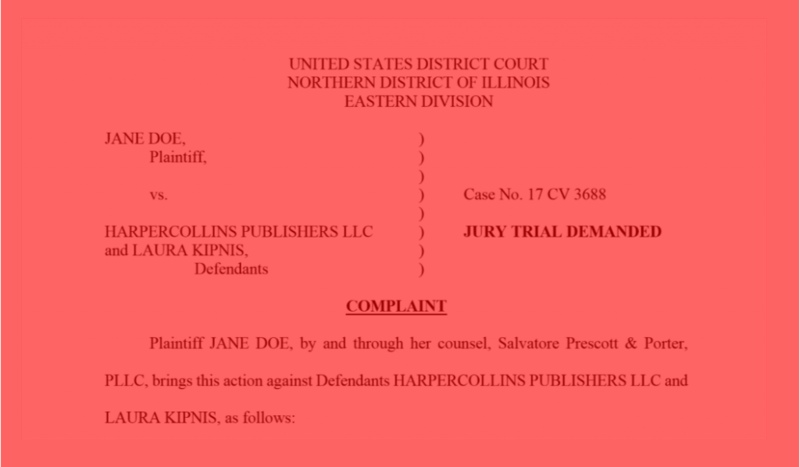 A graduate student in Northwestern University’s Philosophy Department filed suit in federal court today in the Northern District of Illinois alleging that Northwestern Professor Laura Kipnis defamed her and invaded her privacy by publishing a false portrayal of her and making misrepresentations about her in her new book, Unwanted Advances: Sexual Paranoia Comes to Campus. The suit also alleges that Kipnis invaded her privacy by disclosing private text messages and other personal details about her private life gleaned from a confidential Title IX process. Beginning on page 4, the complaint contains Jane Doe’s account of the relevant facts, which provide a different picture of what happened between Doe and Ludlow than is represented by Kipnis in her book, or by Ludlow. Details of the specific legal complaints—public disclosure of private facts, false light invasion of privacy, defamation, and intentional infliction of emotional distress—can be found beginning on page 17 of the lawsuit.